You will not be able to start VMs until this problem is fixed. 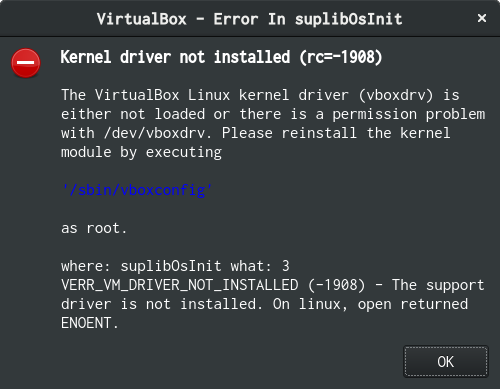 vboxdrv.sh: failed: Look at /var/log/vbox-install.log to find out what went wrong. This system is not currently set up to build kernel modules (system extensions). vboxdrv.sh: Building VirtualBox kernel modules. make: 警告: 副次 make で -jN を強制指定しました: jobserver モードを無効にします. Makefile:937: *** "Cannot generate ORC metadata for CONFIG_UNWINDER_ORC=y, please install libelf-dev, libelf-devel or elfutils-libelf-devel". 中止. $ sudo sh -c "cd /usr/src/kernels/$(uname -r) && make oldconfig && make prepare"